Objective: The aim of this study was to assess the influence of traditional herbal formulas, including Bangpungtongseong-san (BPTSS; Fangfengtongsheng-san, Bofu-tsusho-san ), Ojeok-san (OJS; Wuji-san, Goshaku-san ), and Oyaksungi-san (OYSGS; Wuyaoshungi-san, Uyakujyunki-san ), on the activities of the human cytochrome P450s (CYP450s) and UDP-glucuronosyltransferases (UGTs), which are drug-metabolizing enzymes. Materials and Methods: The activities of the major human CYP450 isozymes (CYP1A2, CYP3A4, CYP2B6, CYP2C9, CYP2C19, CYP2D6, and CYP2E1) and UGTs (UGT1A1, UGT1A4, and UGT2B7) were investigated using in vitro fluorescence-based and luminescence-based enzyme assays, respectively. The inhibitory effects of the herbal formulas were characterized, and their IC50values were determined. Results: BPTSS inhibited the activities of CYP1A2, CYP2C19, CYP2E1, and UGT1A1 while it exerted relatively weak inhibition on CYP2B6, CYP2C9, CYP2D6, and CYP3A4. BPTSS also negligibly inhibited the activities of UGT1A4 and UGT2B7, with IC50values in the excess of 1000 μg/mL. OJS and OYSGS inhibited the activity of CYP2D6, whereas they exhibited no inhibition of the UGT1A4 activity at doses <1000 μg/mL. In addition, OJS inhibited the CYP1A2 activity but exerted a relatively weak inhibition on the activities of CYP2C9, CYP2C19, CYP2E1, and CYP3A4. Conversely, OJS negligibly inhibited the activities of CYP2B6, UGT1A1, and UGT2B7 with IC50values in excess of 1000 μg/mL. 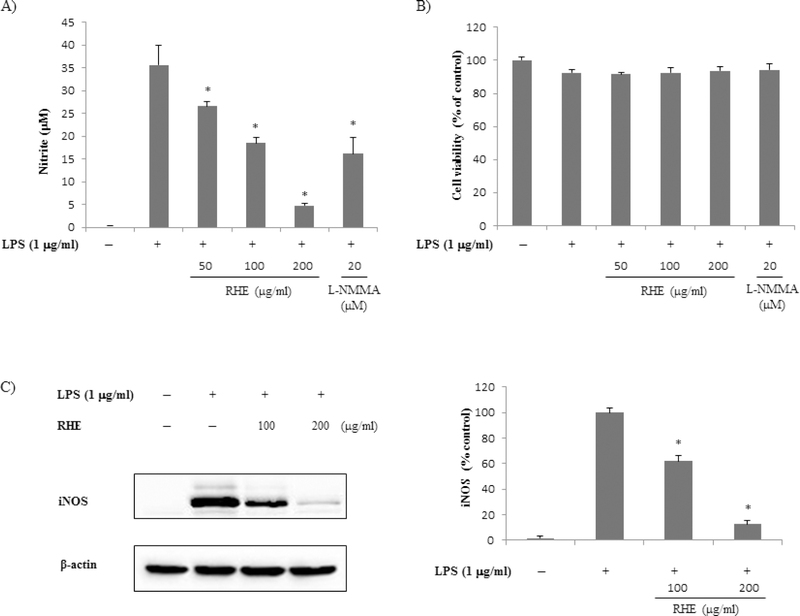 OYSGS weakly inhibited the activities of CYP1A2, CYP2C19, CYP2E1, CYP3A4, and UGT1A1, with a negligible inhibition on the activities of CYP2B6, CYP2C9, and UGT2B7, with IC50values in excess of 1000 μg/mL. Conclusions: These results provide information regarding the safety and effectiveness of BPTSS, OJS, and OYSGS when combined with conventional drugs. Abbreviation used: BPTSS: Bangpungtongseong-san, OJS: Ojeok-san, OYSGS: Oyaksungi-san, CYP450s: cytochrome P450s, UGTs: UDP-glucuronosyltransferases, MSDs: Musculoskeletal disorders, NSAIDs: nonsteroidal anti-inflammatory drugs, EOMCC: 7-ethoxy-methyloxy-3-cyanocoumarin, DBOMF: di(benzyloxymethoxy)fluorescein, BOMCC: 7-benzyloxy-4-trifluoromethylcoumarin, HPLC: High-performance liquid chromatography, PDA: photo diode array, SEM: standard error of the mean, UDPGA: uridine 5'-diphosphoglucuronic acid. Background: Alternanthera sessilis is a medicinal herb which is consumed as vegetable and used as traditional remedies of various ailments in Asia and Africa. Objective: This study aimed to investigate the antiglucosidase and antioxidant activity of solvent fractions of A. sessilis leaf and callus. Materials and Methods: Leaf and callus methanol extracts were fractionated to produce hexane, chloroform, ethyl acetate, butanol, and water fractions. 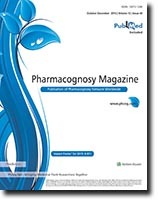 Antiglucosidase and 1,1-diphenyl-2-picrylhydrazyl scavenging activities as well as total phenolic (TP), total flavonoid (TF), and total coumarin (TC) contents were evaluated. Lineweaver–Burk plot analysis was performed on leaf and callus fractions with the strongest antiglucosidase activity. Results: Leaf ethyl acetate fraction (LEF) had the strongest antiglucosidase (EC50 0.55 mg/mL) and radical scavenging (EC50 10.81 μg/mL) activity among leaf fractions. Callus ethyl acetate fraction (CEF) and chloroform fraction had the highest antiglucosidase (EC50 0.25 mg/mL) and radical scavenging (EC50 34.12 μg/mL) activity, respectively, among callus fractions. LEF and CEF were identified as noncompetitive and competitive α-glucosidase inhibitors, respectively. LEF and CEF had greater antiglucosidase activity than acarbose. Leaf fractions had higher phytochemical contents than callus fractions. LEF had the highest TP, TF, and TC contents. Antiglucosidase and antioxidant activities of leaf fractions correlated with phytochemical contents. Conclusion: LEF had potent antiglucosidase activity and concurrent antioxidant activity. CEF had the highest antiglucosidase activity among all fractions. Callus culture is a promising tool for enhancing production of potent α-glucosidase inhibitors. Abbreviations used: LHF: Leaf hexane fraction, LCF: Leaf chloroform fraction, LEF: Leaf ethyl acetate fraction, LBF: Leaf butanol fraction, LWF: Leaf water fraction, CHF: Callus hexane fraction, CCF: Callus chloroform fraction, CEF: Callus ethyl acetate fraction, CBF: Callus butanol fraction, CWF: Callus water fraction, TP: Total phenolic, TF: Total flavonoid, TC: Total coumarin. Background: Myoporum bontioides A. Gray is a commonly used medicinal plant in China. 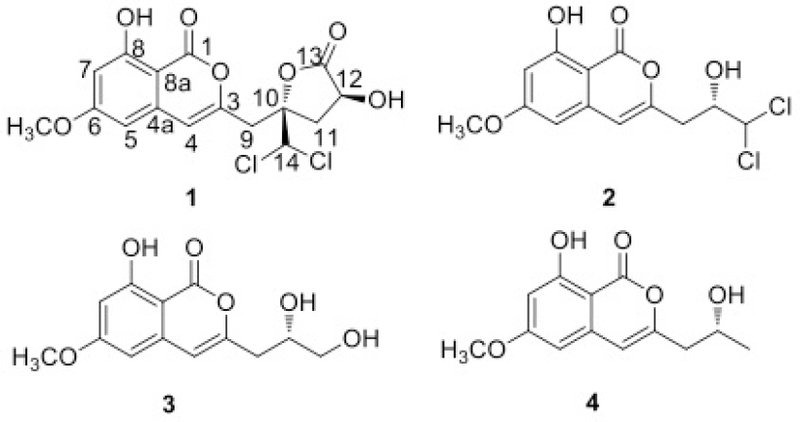 Recently, the chemical and bioactive investigations to the endophytic fungi of this plant have led to several new compounds with antimicrobial and cytotoxic activities. 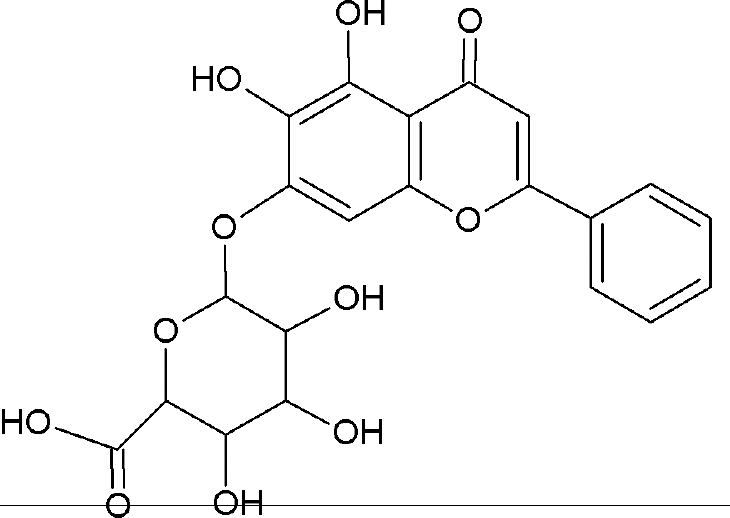 To find out more active molecules, the metabolites of an endophytic fungus, Trichoderma sp. 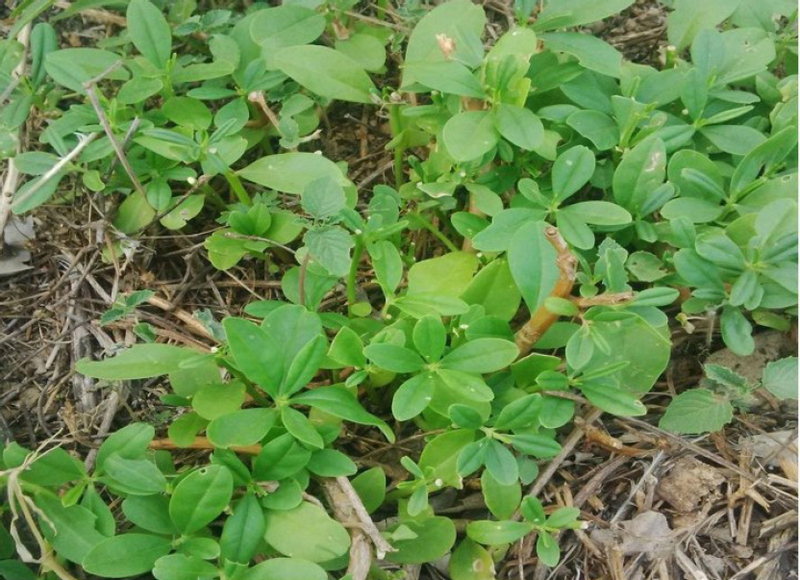 09 from the root of Myoporum bontioides were investigated. 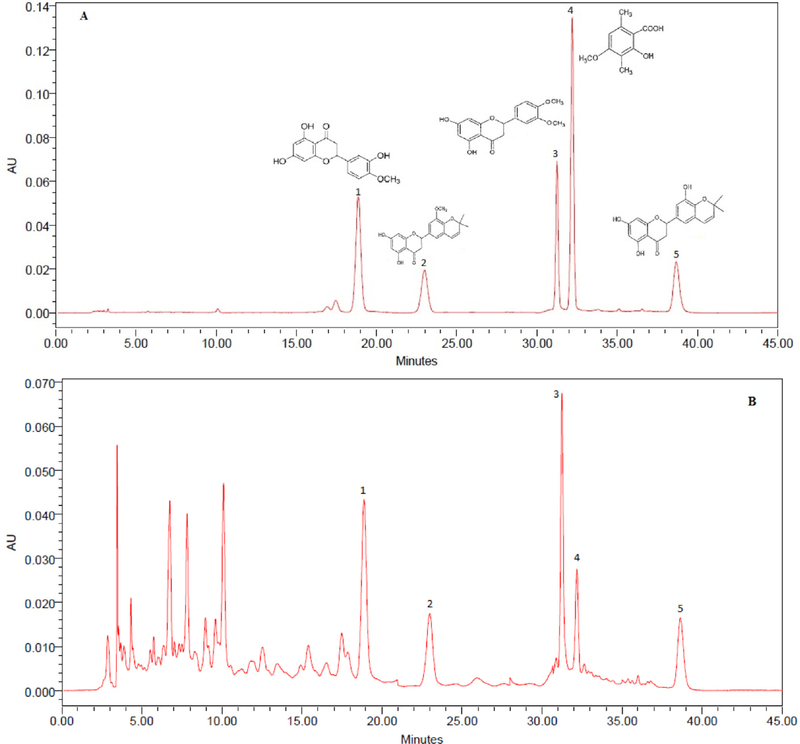 Materials and Methods: The metabolites were isolated by column chromatography on silica gel, and their structures were elucidated on the basis of spectroscopic analysis[one-dimensional (1D), two-dimensional (2D)-nuclear magnetic resonance (NMR), Mass spectrometry (MS)], and by comparison with the published data. The dilution method was used for the evaluation of antifungal activity. 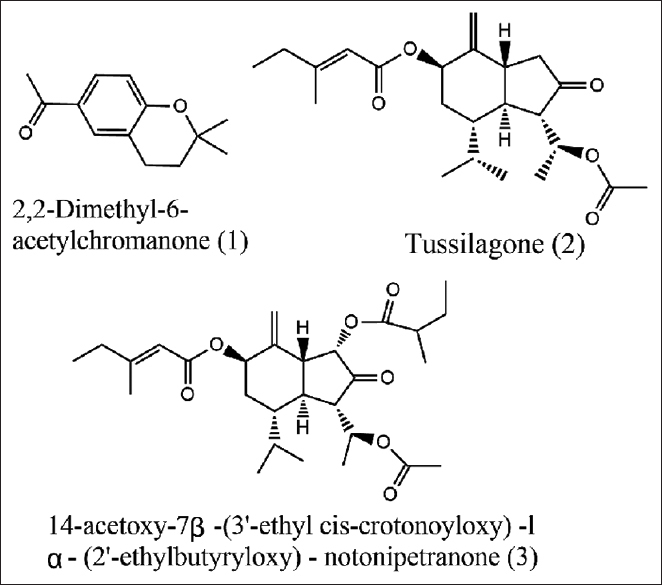 Results: Four metabolites were isolated and identified as: dichlorodiaportinolide (1), dichlorodiaportin (2), diaportinol (3), and diaportin (4). 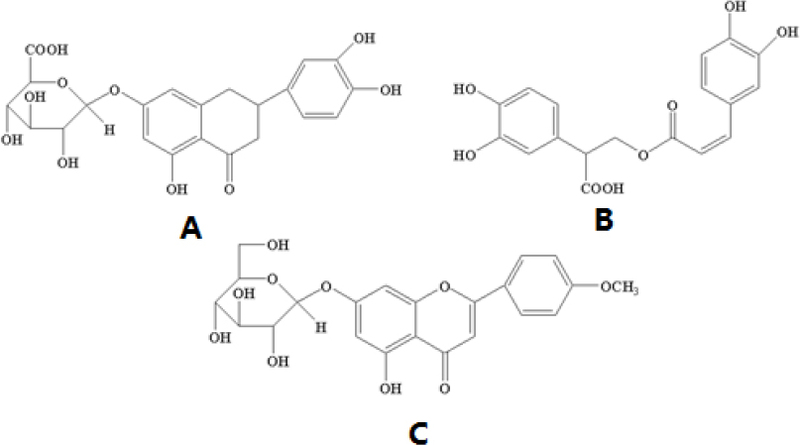 Compounds1 and 2 showed weak to high antifungal activities against Colletotrichum musae (Berk. and M. A. Curtis) Arx and Rhizoctonia solani Kühn, as compared with the positive control. Conclusions: Compound 1 was a new isocoumarin being worthy of consideration for the development and research of antifungal agents. Abbreviations used: IR: Infrared Radiation, HR-ESI-MS: High resolution electrospray ionization mass spectroscopy, LCMS-IT-TOF: Liquid chromatography mass spectroscopy-Ion trap-Time-of-flight, UV: Ultraviolet-visible, HMBC: Heteronuclear multiple bond correlation, NOE: Nuclear Overhauser effect. Background: Lippia sidoides (Verbenaceae) is used in Brazilian folk medicine as an antiseptic, and it is usually applied topically on skin, mucous membranes, mouth, and throat, or used for vaginal washings. Objectives: To analyze the chemical composition of the essential oil from L. sidoides collected in São Gonçalo do Abaeté, Minas Gerais and grown in Hidrolândia, Goiás; to evaluate the antimicrobial activity of the essential oil, crude ethanol extract, and hexane, dichloromethane, ethyl-acetate, and aqueous fractions (AFs); to study the antinociceptive, anti-inflammatory, and central nervous system activities of the crude ethanol extract. Materials and methods: The essential oils were obtained by hydro-distillation using a Clevenger-type apparatus and analyzed by GC/MS. The antimicrobial activity in vitro was performed by broth microdilution method. The pharmacological tests were performed using female Swiss albino mice. Results: The major components of the essential oil were isoborneol (14.66%), bornyl acetate (11.86%), α -humulene (11.23%), α -fenchene (9.32%), and 1.8-cineole (7.05%), supporting the existence of two chemotypes of this species. The hexane fraction (HF) had good antifungal activity against Cryptococcus sp. ATCC D (MIC = 31.25 μg/mL) and Cryptococcus gatti L48 (MIC = 62.5 μg/mL). In the pharmacological tests, the crude ethanol extract presented antinociceptive and anti-inflammatory activities. Conclusion: Given that the ethanol extract of L. sidoides is included in the Formulary of Phytotherapeutic Agents of the Brazilian Pharmacopeia as an anti-inflammatory for oral cavities, the present work provides scientific evidence to back this use and highlight the importance of selecting the appropriate chemotype on the basis of the expected biological response. Abbreviations used: UFG: Universidade Federal de Goiás; HF: hexane fraction; DF: dichloromethane fraction; EAF: ethyl acetate fraction; AF: aqueous fraction; MeOH: methanol; MIC: minimum inhibitory concentration; ATCC: American Type Culture Collection; MH: Müller Hinton; DMSO: dimethyl sulfoxide; RPMI: Roswell Park Memorial Institute; NaCl: sodium chloride; μL: microliters; mL: milliliters; μg: microgram; kg: kilogram; h: hour; min: minute; cm: centimeter; COBEA: Brazilian College of Animal Experiments; p.o. :, oral; i.p. : intraperitoneal; s.c.: subcutaneous; SEM: standard error of the mean; RI: retention indices. Background: It has been known that oxidative stress induced by alcohol played a crucial role in the formation of alcoholic liver disease. Although the formation mechanisms underlying liver injury induced by alcohol still remained largely unknown, it has been considered that oxidative stress played a core role in the pathogenesis of hepatocyte damage. Objective: The aim of this study was to investigate the effects of soyasaponin Bb (Ss-Bb) on oxidative stress in alcohol-induced rat hepatocyte injury. Results: It has been shown that the administration of Ss-Bb could significantly restore antioxidant activity in BRL 3A cells. Moreover, the impaired liver function and morphology changes resulting from ethanol exposure were improved by Ss-Bb treatment. Treatment with a pharmacological inhibitor of haem oxygenase-1 (HO-1) indicated a critical role of HO-1 in mediating the protective role. 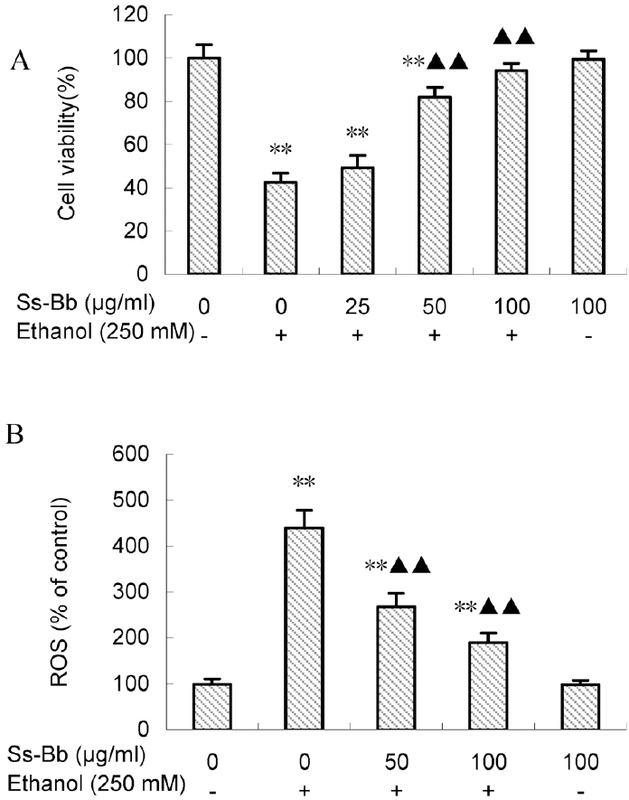 Finally, we found that pretreatment with Ss-Bb to ethanol exposure cells increased the expression level of HO-1.Conclusion: It was suggested that Ss-Bb may protect against alcohol-induced hepatocyte injury through ameliorating oxidative stress, and the induction of HO-1 was an important protective mechanism. Background: Leishmaniasis and African trypanosomiasis are recognized as the leading causes of mortality and morbidity with the greatest prevalence in the developing countries. They affect more than one billion of the poorest people on the globe. Objective: To find a cheap, affordable, safe, and efficacious antileshmanial and antitrypanosomal natural drug and to elucidate its probable mode of action. 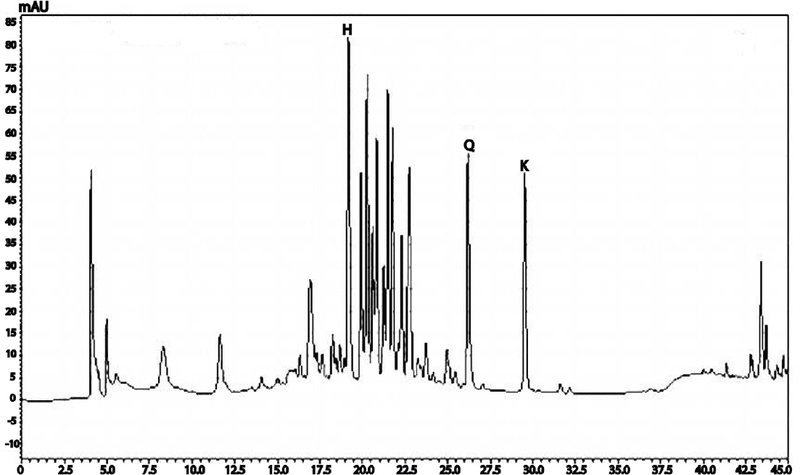 Materials and Methods: Phytochemical investigation of the non-polar fraction of the methanol extract of leaves of Ochrosia elliptica Labill. 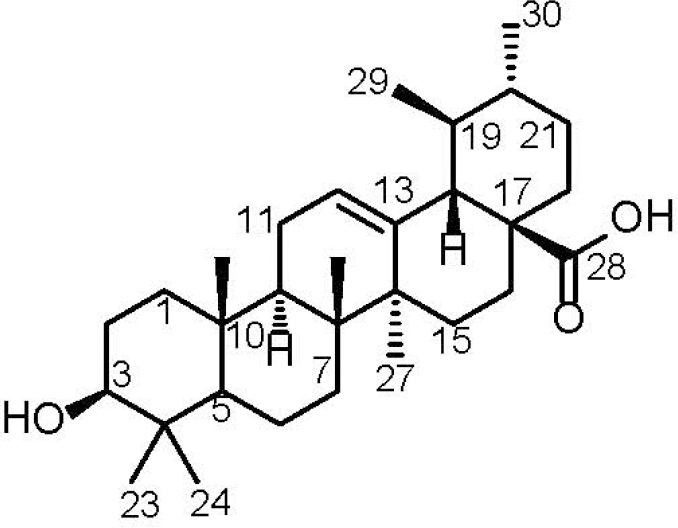 (Apocyanaceae) resulted in the isolation of ursolic acid, which was unambiguously determined based on HR-ESI-FTMS, extensive 1D and 2D NMR spectroscopy. It was further tested for its cytotoxicity, antimicrobial, antimalarial, antileishmanial, and trypanocidal potency. 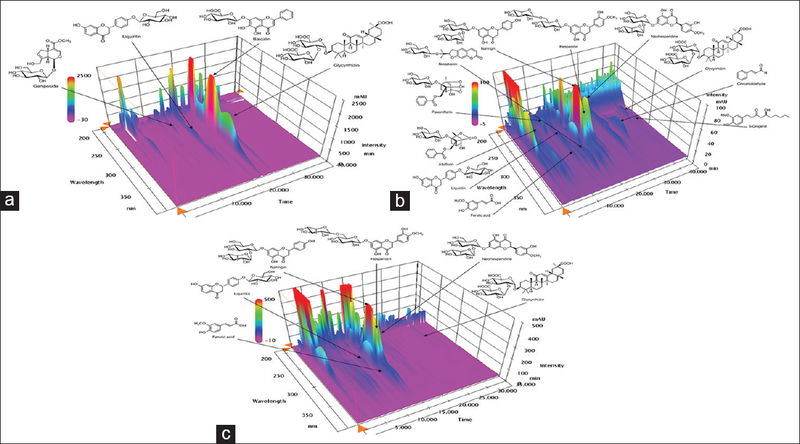 in-silico molecular modeling studies were conducted on six vital parasitic enzymes including farnesyl diphosphate synthase, N -myristoyl transferase, pteridine reductase 1, trypanothione reductase, methionyl-tRNA synthetase, and inosine–adenosine–guanosine nucleoside hydrolase to discover its potential mode of action as antitrypanosomal and antileishmanial agent. 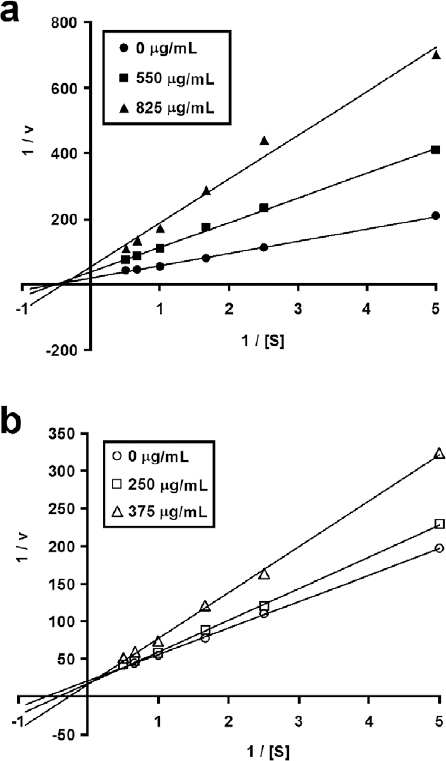 Results: Ursolic acid displayed considerable antitrypanosomal and antileishmanial activities with IC50 values ranging between 1.53 and 8.79 μg/mL. It showed superior antitrypanosomal activity as compared to the standard drug difluoromethylornithine (DFMO), with higher binding affinities towards trypanothione reductase and pteridine reductase 1. It displayed free binding energy of -30.73 and -50.08 kcal/mole towards the previously mentioned enzymes, respectively. In addition, ursolic acid exhibited considerable affinities to farnesyl diphosphate synthase, N -myristoyl transferase and methionyl-tRNA synthetase with free binding energies ranging from -42.54 to -63.93 kcal/mole. Conclusion: Ursolic acid offers a safe, effective and cheap antitrypanosomal and antileishmanial candidate acting on several key parasitic enzymes. Abbreviations used: AHT: African Human Trypanosomiasis, ATCC: American type cell culture, BuOH: n -butanol, DCM: dichloromethane, DFMO: difluoromethylornithine, EtOAc: ethyl acetate, FCS: fetal calf serum, HMBC: Heteronuclear Multiple Bond Correlation, HMQC: Heteronuclear Multiple-Quantum Correlation, HR-ESI-FTMS: High Resolution Electrospray ionozation Mass Spectrometry, MENA: Middle East and North Africa, MeOH: Methanol, MRSA: Methicillin-resistant Staphylococcus aureus , NTDs: Neglected tropical diseases, TLC: Thin layer chromatography, UA: Ursolic acid, UV: Ultra violet, WHO: World Health Organization. Objective: To investigate the effect of methanolic leaf extract of Talinum triangulare on hematological parameters, enzymatic and non-enzymatic antioxidant status,and serum lipid in Wistar rats fed standard laboratory, or 2% cholesterol-enrich diet. Material and Methods: Wistar rats (180-210g) divided into six groups of six animals (males) each were fed 2% cholesterol-enriched diet and orally treated with 0.9% saline or extract of Talinum triangulare (250, 500, and 1000 mg/kg per body weight) daily for eight weeks. Lipid profile, lipid peroxidation (MDA), hematological parameters, and their functional indices and serum antioxidant enzymes (catalase, glutathione -S-transferase, and superoxide dismutase) activities and glutathione status were assessed in normal and diet-induced hypercholesterolemic extract treated rats and compared with the rats treated with 100 mg/kg per bwt standard drug gemfibrozil. Results: A significant (P < 0.05) increase in lipid profile (total glyceride, total cholestrol, low-density lipoprotein, and very low-density lipoprotein), MDA and reduction (P < 0.05) in enzymatic and nonenzymatic antioxidant status coupled with alterations in hematological parameters was observed in the serum of hypercholesterolemic rats when compared with animals on a normal diet. 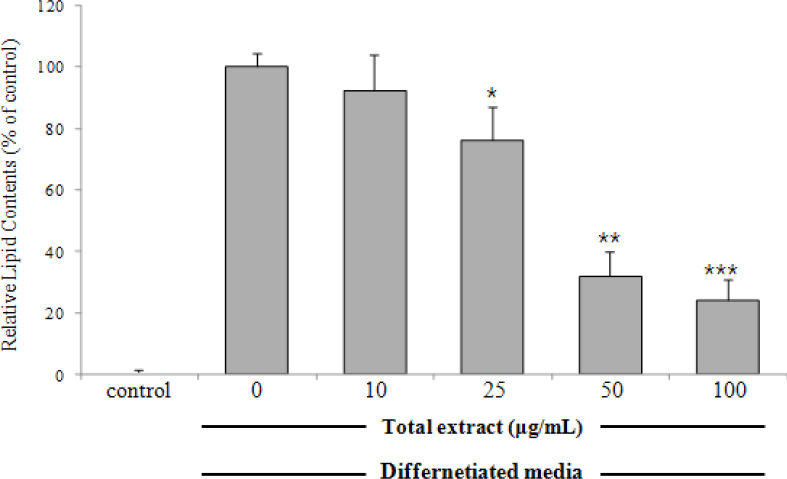 Coadministration of methanolic leaf extracts of Talinum triangulare or gemfibrozil significantly (P < 0.05) restored the elevated serum lipid profile, MDA, and the deranged hematological parameters to near normal. The extract also protected against hypercholesterolemic-induced diminished enzymatic and nonenzymatic antioxidant status. The activities of the plant extract are dose (250, 500, and 1000 mg/kg) dependent and it compared favorably with the standard drug gemfibrozil. Conclusion: The present study suggested that the extract of Talinum triangulare might protect against hypercholesterolemic-induced altered lipid profiles, oxidative stress, and also improve the status of antioxidant defense system and hematopoiesis. Abbreviation used: Lipid peroxidation (MDA), (catalase (CAT), glutathione–S-transferase (GST), superoxide dismutase (SOD), glutathione (GSH), Thrombocytes indices (PLT), Red blood cell (RBC), Packed cell volume (PVC), Mean corpuscular hemoglobin(MCH), Mean corpuscular hemoglobin concentration (MCHC), Total glyceride (TG), Very low density lipoprotein (VLDL), Total cholesterol (TC), Low density lipoprotein (LDL), High density lipoprotein (HDL) and 3-Hydroxy-3-methyl-glutaryl-CoA reductase(HMG-CoA).